A personalized, scenario driven, “What-if…?” presentation system for retirement distribution. 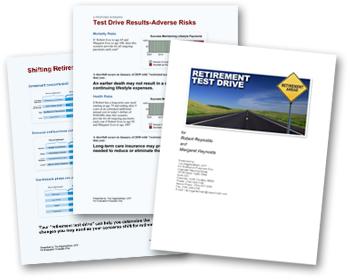 Retirement Test Drive gives your clients the visual comparisons they need to see their situation and problems, and to understand the implications and solutions to those problems. Before making any changes in their current plan, clients can see VISUALLY how a proposed change would help them. The results are quick and simple; you either have enough or you don’t. It points out how much their assets are worth at the time of the shortfall. A shortfall just means they have to adjust their lifestyle or use some of their restricted assets. The situation is not hopeless but points out that they need planning. We then make intelligent suggestions based on what the program has calculated or knows. Point out additional savings required to eliminate the shortfalls. Not just recommend downsizing, if they own a home, but they can see how much equity is in their home at the time of the shortfall. Helps them to distinguish between expenses for nice to have items and those essential to their lifestyle. Comparisons are visual -- clients SEE the differences. For the clients, we made it quick and simple and accurate. It’s made it easy for YOU to become a retirement planning specialist. You don’t need to be trained in retirement planning distribution, all you have to do is use the multiple scenarios and the visual results: you can see whether each recommendation is better or not, if it is, save it and build upon it. If you NEED direction or guidance, the program provides that through the test drive result pages where it shows the intelligent solutions/suggestions. You can see different things to try, by getting recommendations and VISUAL feedback. Unique adverse risk calculations show mortality risks and health risks – ideal for illustrating life insurance and long-term care insurance in addition to retirement products. You also get printing and graphing flexibilities to fit every client. A Multiple Scenario, Visual Presentation System for Retirement Distribution Planning! This product sits on the Web-based PlanLab platform. The complete functionality of PlanLab comes in an easy-to-use, web-based package that requires little or no training to get started. Intuitive features in PlanLab make it easy to collect and analyze client data, motivate clients to action, and monitor their progress. Impact is known throughout the industry for creating sales presentations that combine numerical analysis and sales psychology to inform, alarm, and motivate clients to take action. Detailed cash flow analysis using all of the specific information provided by the client. Test drive existing plans to see where retirement is headed. Also, test drive any changes you are considering. Adverse risk sections automatically let you see the effects on retirement of a long-term care expense. Go back and forth between Estate Tax Analysis1 to see the effects of your retirement planning on your estate planning. 1 Estate Tax Analysis is an additional Impact analysis tool that uses the same data to focus on estate planning. Adverse risk pages let you see the effects of dying in various years.